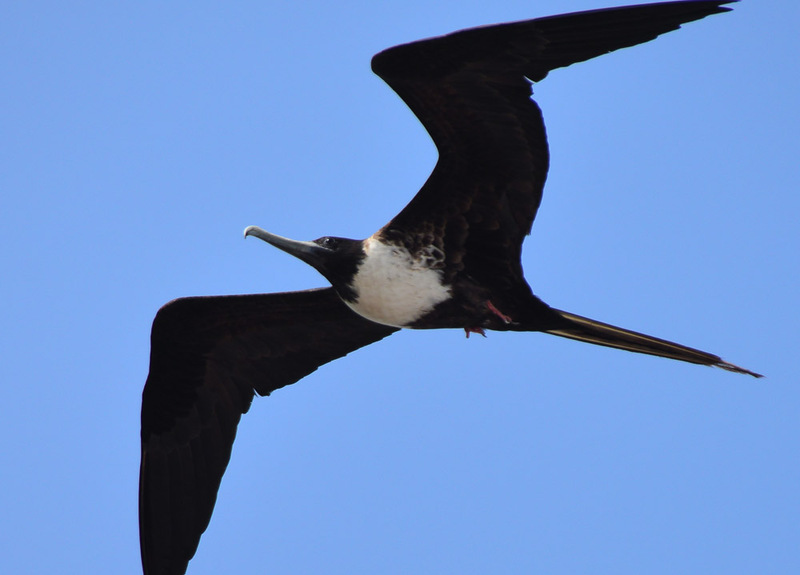 At around midnight, we slip quietly across the equator and back into the southern hemisphere. We are at last approaching South America proper. 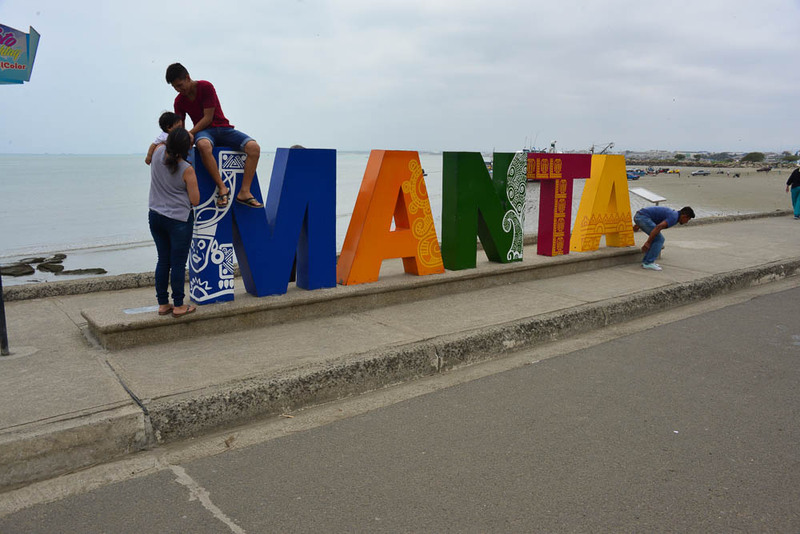 Our first stop is the port of Manta on the desert coast of Equador. 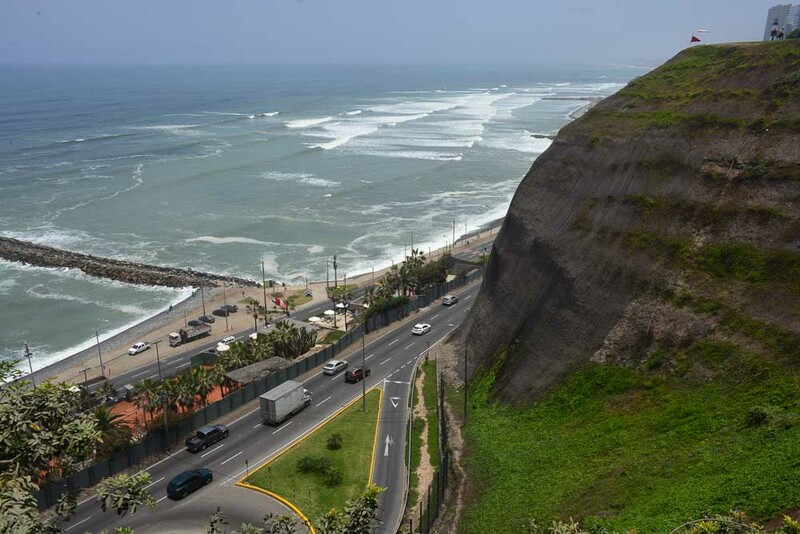 Along this part of the coast of both Equador and Peru, there is very little rainfall and the desert comes right down to the ocean. If it weren’t for the underground aquifers, it would be difficult to live here. There is a cold current running up this coast of South America. This has two results; first the crill that come up in this current provide the basis for the extensive fishing industry and second, the daytime temperatures are much lower than we expect just south of the equator where the sun is hidden by the coastal cloud. 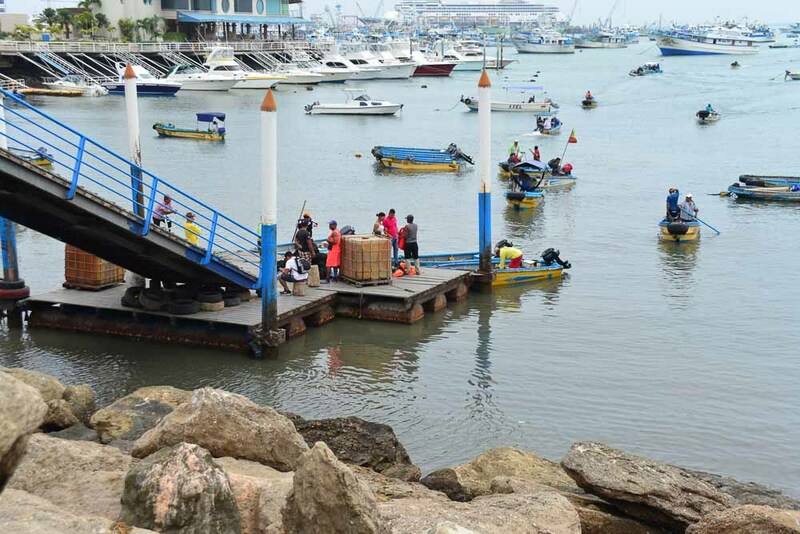 Above all else, Manta is a fishing port. 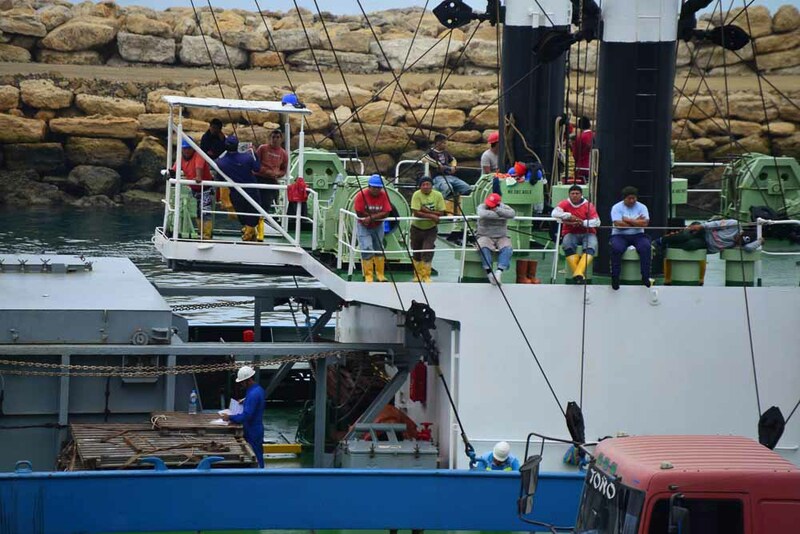 Fishing is a major export for this country and the harbour is full of large fishing vessels. On the opposite side of the pier a fishing vessel is waiting to unload and the crew watch us docking before they start unloading their catch. It is Sunday and we expect most places to be closed. Waiting to unload their catch – I wonder what they think of us. 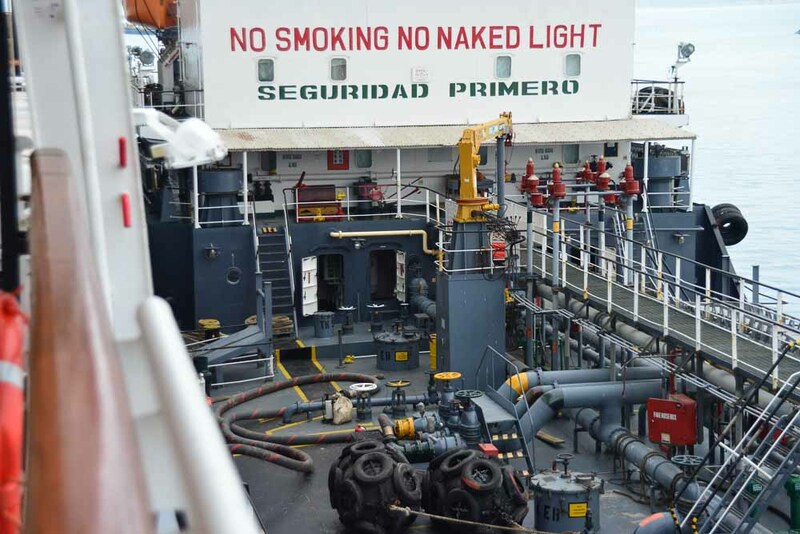 Outside our window is the refuelling ship providing fuel for the next part of the voyage. Just the thing if you like pipes and valves! The harbour is full of fishing vessels. Locals take sunday boat rides. This sign is a favourite spot for photos. 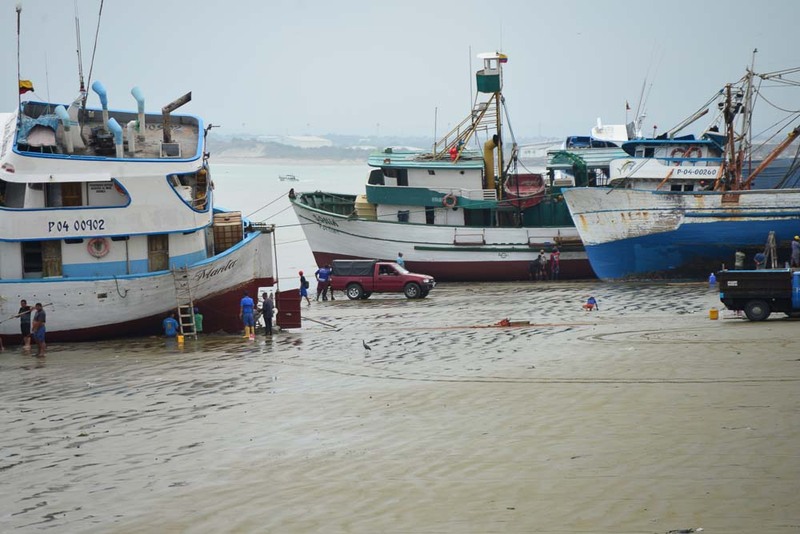 No need for a dry dock – just wait for the tide to go down and get to work. 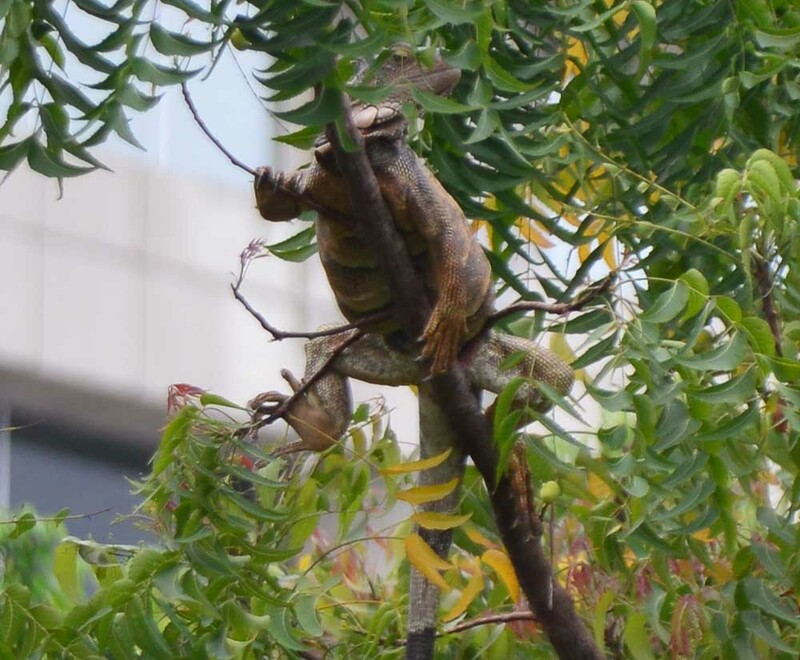 In the trees above the market, iguanas laze away the day. It seems that the Market comes out on a Sunday. Manta doesn’t see many cruise ships, so this if definitely for the locals. 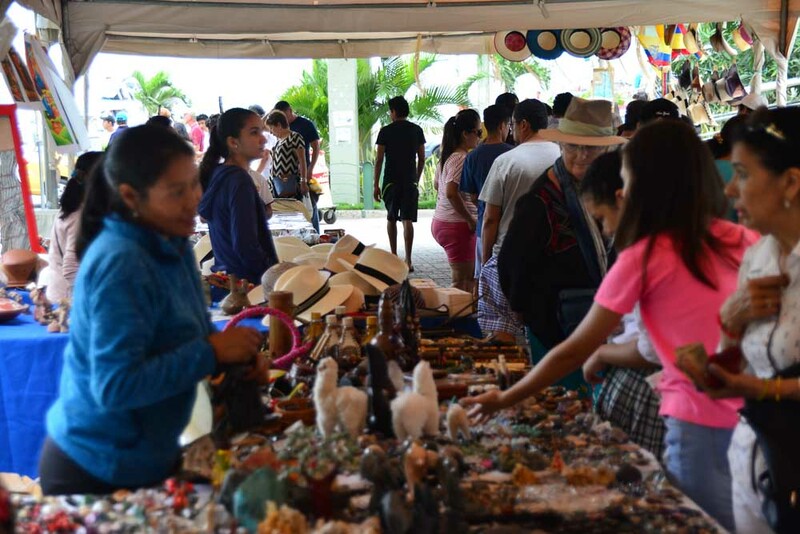 The stalls are filled with high quality arts and crafts including, of course, the Panama Hat, for which Equador is famous. Jacqui surveys the high quality arts and crafts for sale. 7th heaven! 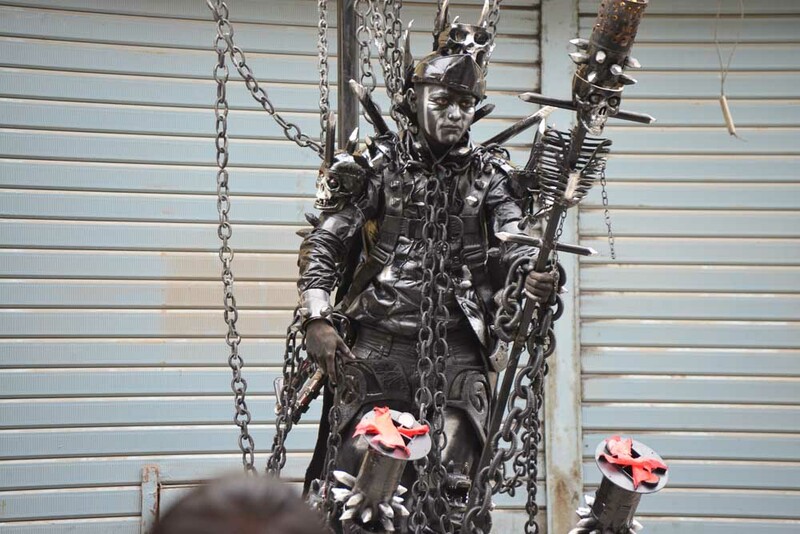 This jewellery maker is dressed for the part. 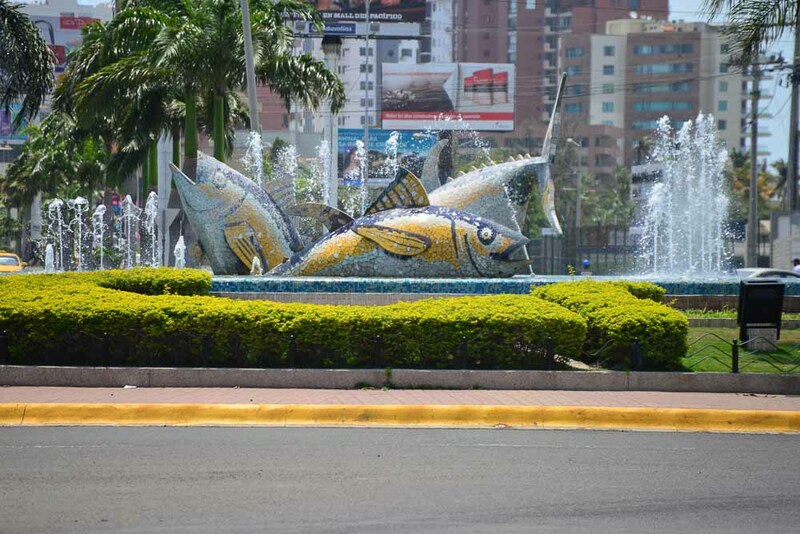 Yellow fin tuna grace this fountain rather than the usual naked women. 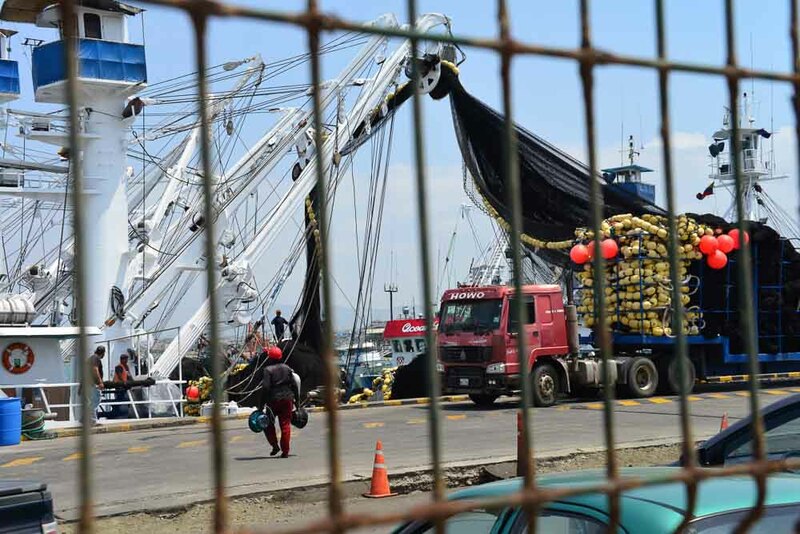 These are seriously large fishing nets being loaded from this truck. 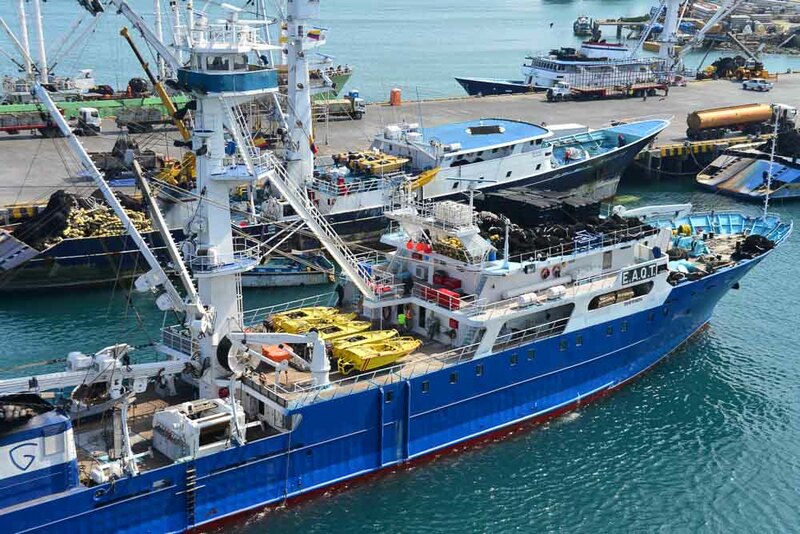 There are lots of these modern trawlers working out of Manta. 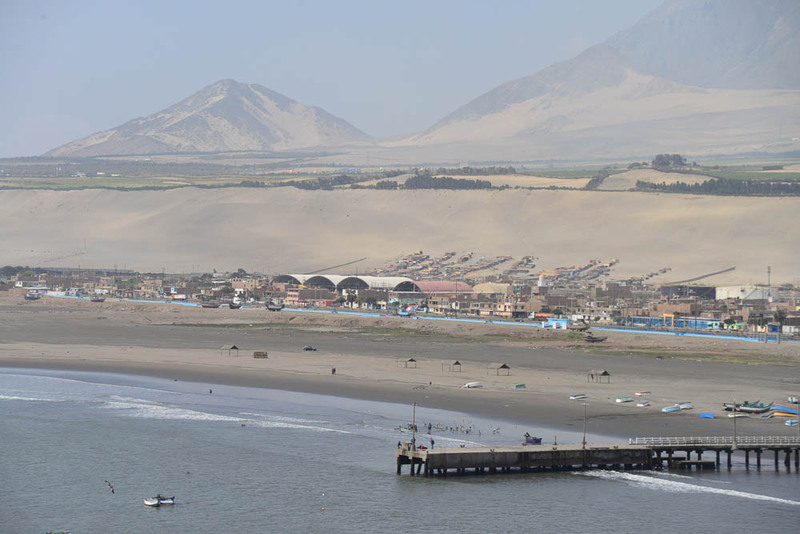 We arrive in Peru in the port of Salaverry, the main entry for the city of Trujillo. 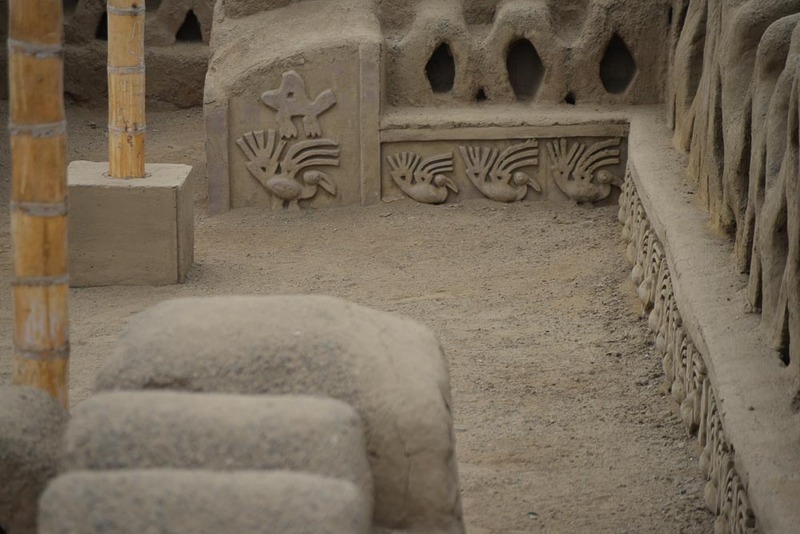 Feeling we ought to see at least one of the ancient sites, we decide to take a tour to see the Chimu city of Chan Chan. 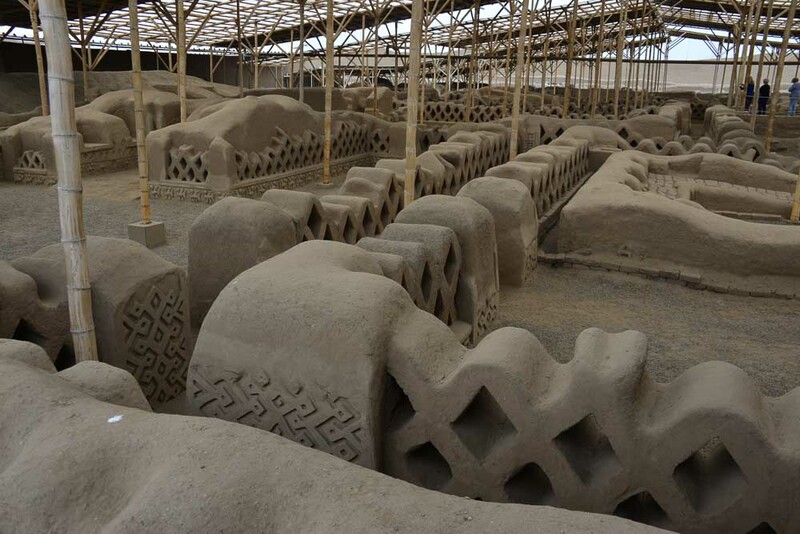 The Chimu people predate both the better known Mayan and Inca peoples and here on the coast they built a city with a population of 100,000 almost entirely from sun dried mud bricks. The archeological site is enormous but much of the city has already been built over in the race to house the ever increasing population. 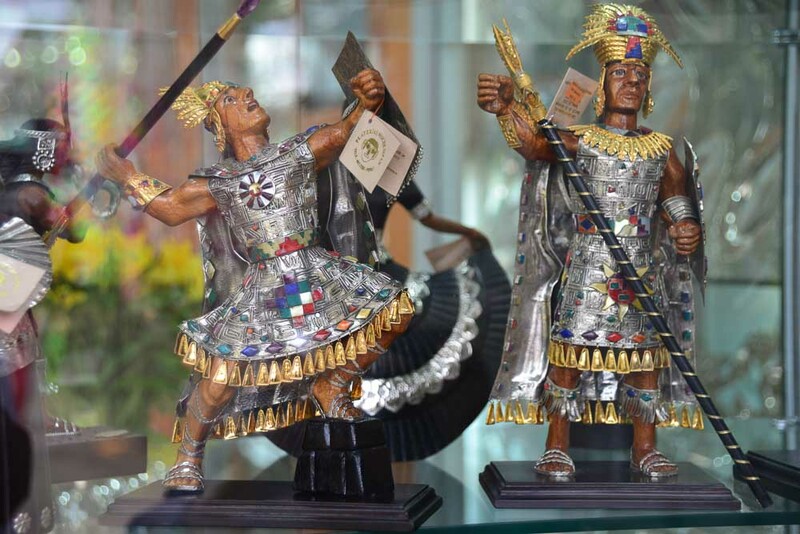 The Chimu were people of the sea and Pelicans and Anchovies feature largely in their decorations. Surprisingly, the fact that they used adobe as their main building material is the main reason that as much of the site still survives. 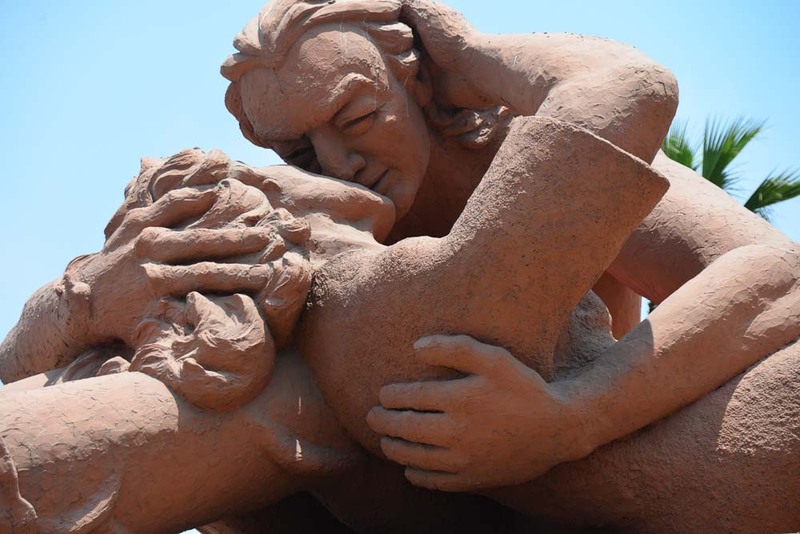 It provided resilience when the many earthquakes that occur in the area made themselves felt. 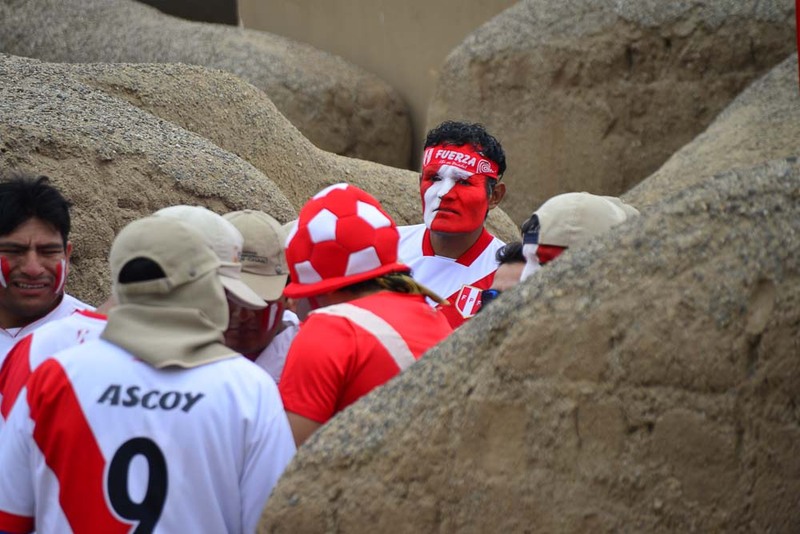 This was the night of the Peru vs Columbia soccer decider for the World Cup. The site workers make it clear which side they are on! Pelicans loom large in their decorations. 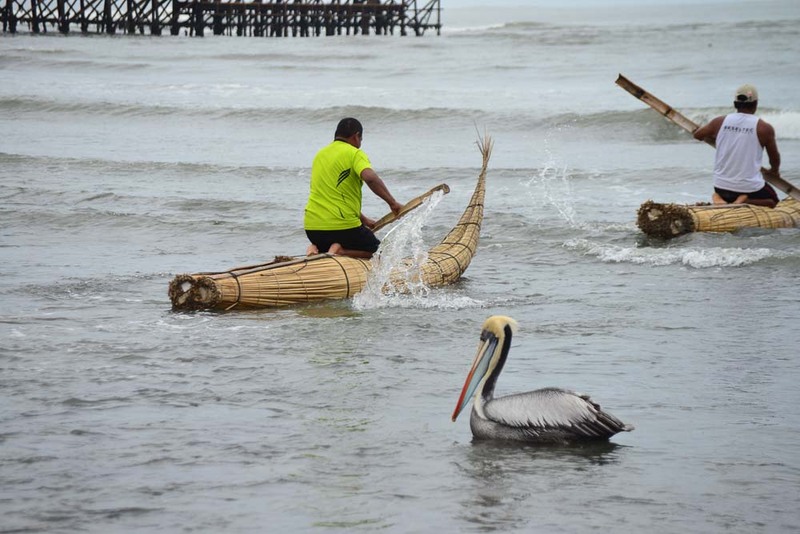 Down on the beach, reed boats provide transport for the more modest fishermen. They claim this is an early surfboard. Surfing is very popular along the coast of Peru. The pelicans look different here – very hansom. As we leave, we can see the desert nature of the landscape. We are told that there have recently been heavy rains due to El Nino … an unusual event which also affects us on the east coast of Australia. 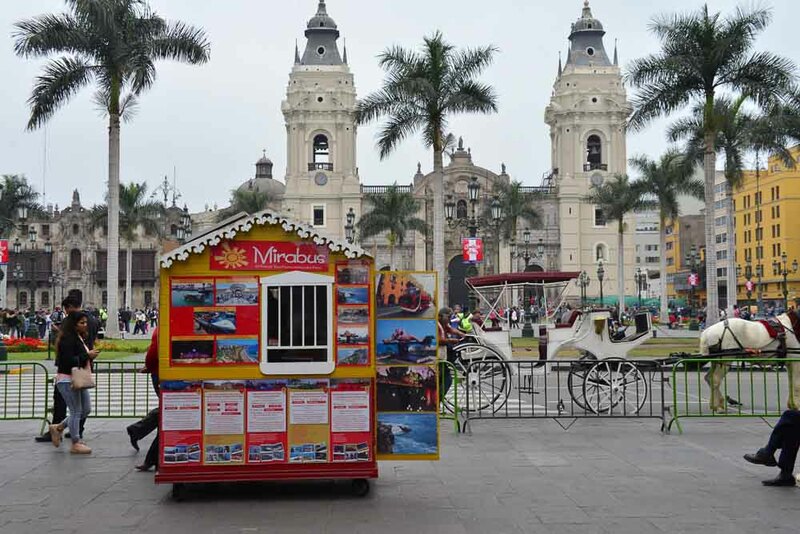 Callao (pronounced Kayo) is the gateway to Lima, the capital city of Peru with a population of more than ten million people. We will be here for two days and on each day choose to take a shuttle into town. 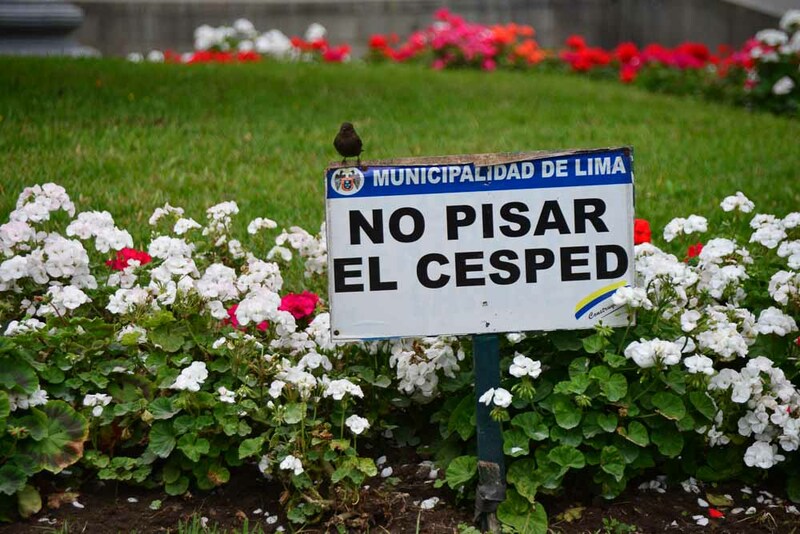 On the first day we go to “downtown” Lima and the second to Mille Flores, the up market area on the coast. Once again, it is cool (around 17 centigrade) and cloudy. 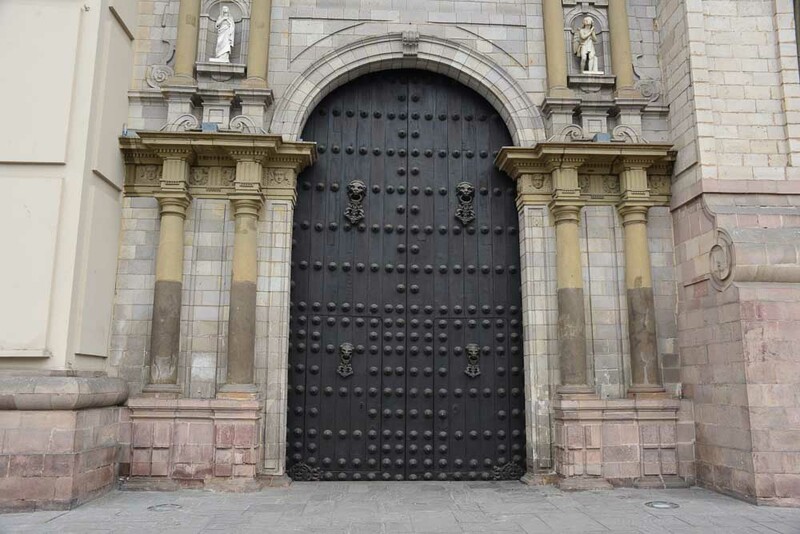 A not very welcoming entrance to the cathedral. The cathedral has now become a fund raiser, charging an entrance fee. Not sure what I feel about that. 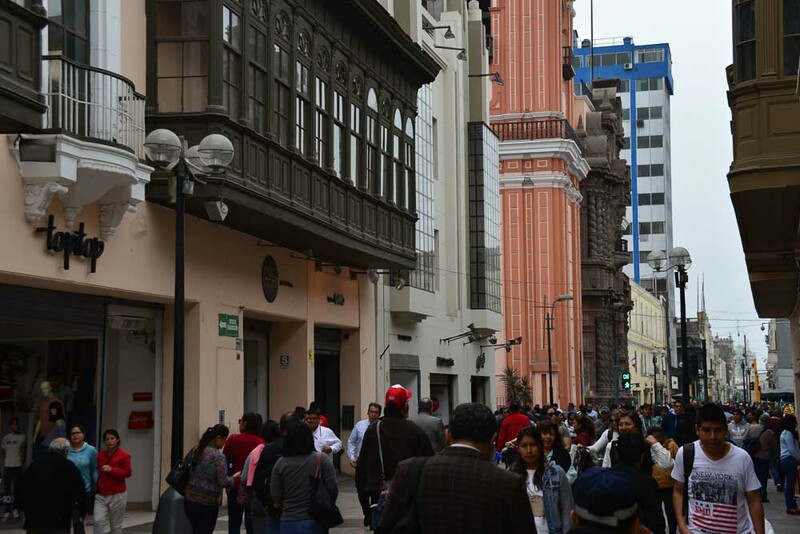 We stroll down Jr de la Union, the pedestrian mall that connects the two main squares. Full of shops and a mish mash of architecture that varies from building to building. Nothing consistant about the buildings here! 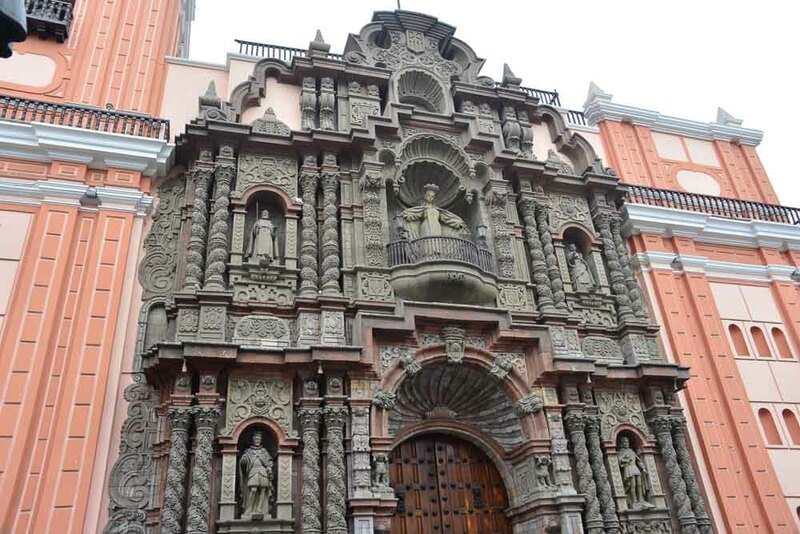 In the middle of Jr de la Union, this fairy castle, it’s enormous door firmly barred against intruders. 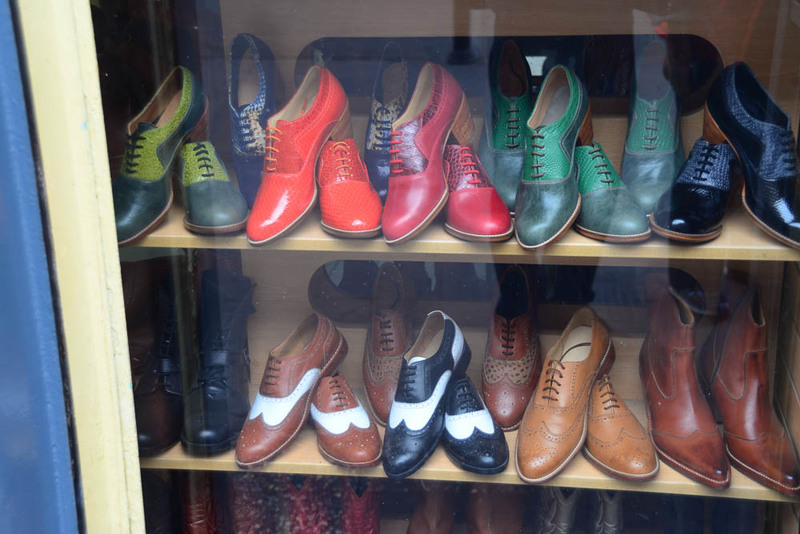 Shoe shops seem to be a big thing here. This guy looks a bit strung up! No … it means don’t TREAD on the grass! 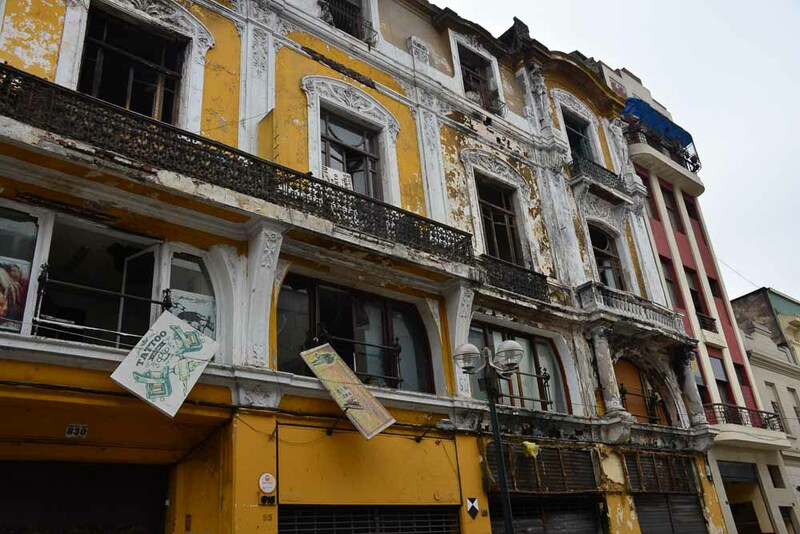 We were warned not to wander out of the main areas of the city and to watch out for muggers. 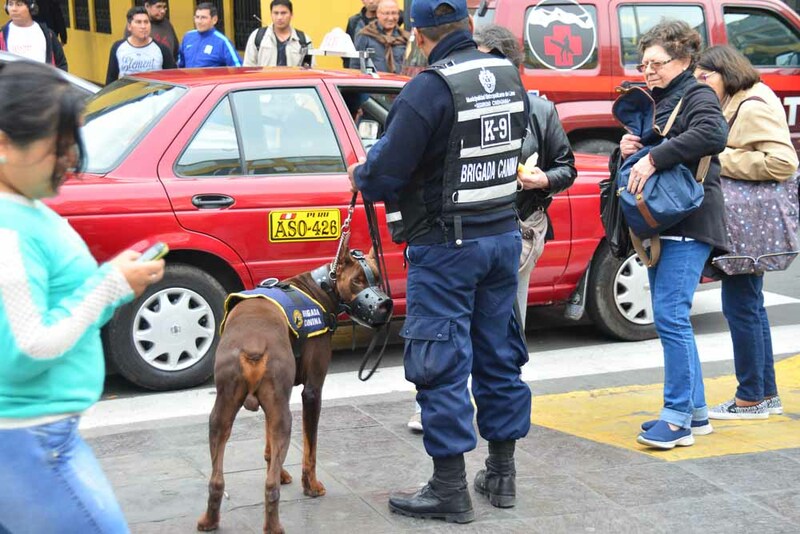 Apparently, there have been a number of cases of tourists being robbed. This is reflected in the high police and military presence everywhere. 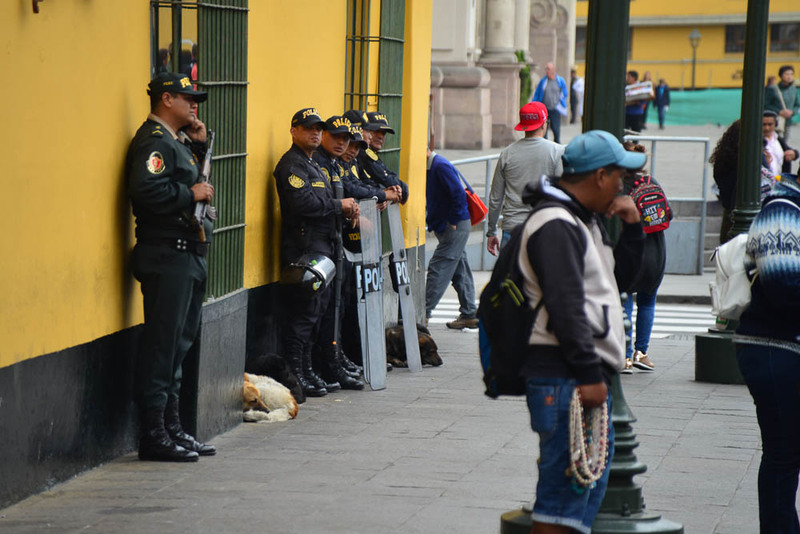 Watching out for trouble … automatic weapons, riot shields and all. 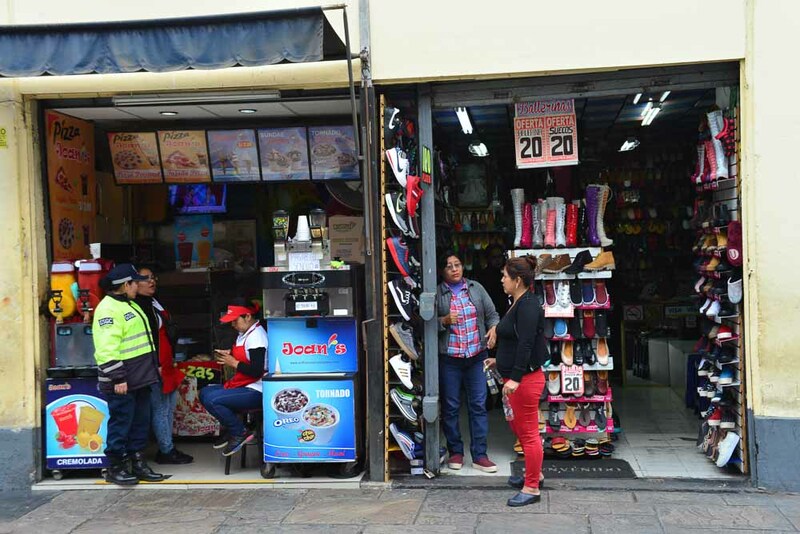 As I say … shoes seem to be big in Lima. Don’t you love the colours! Now that is a muzzle! 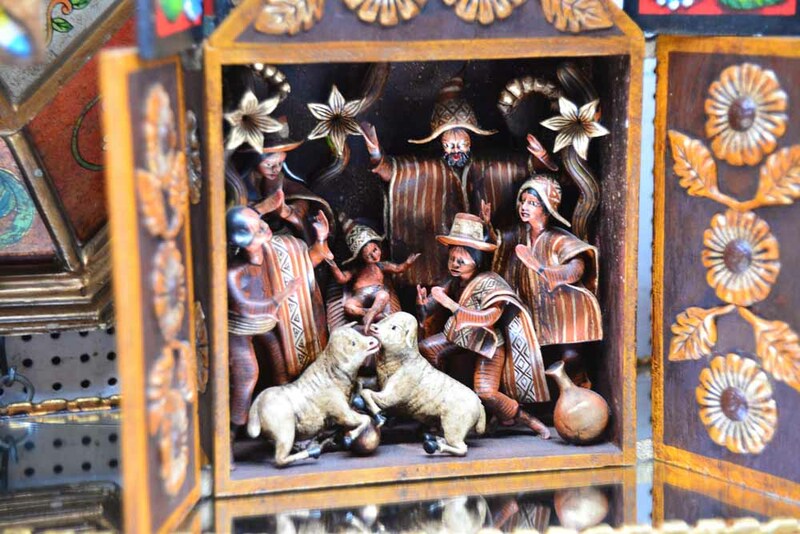 Lots of these scenes in display cases. 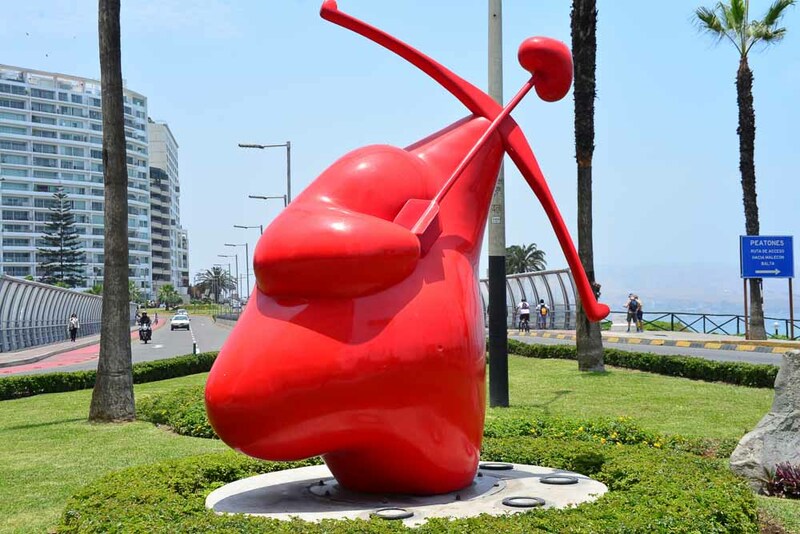 The coastal district of Mille Flores is the up market area of Lima with wide streets, parks and sculptures on the coastal walk. 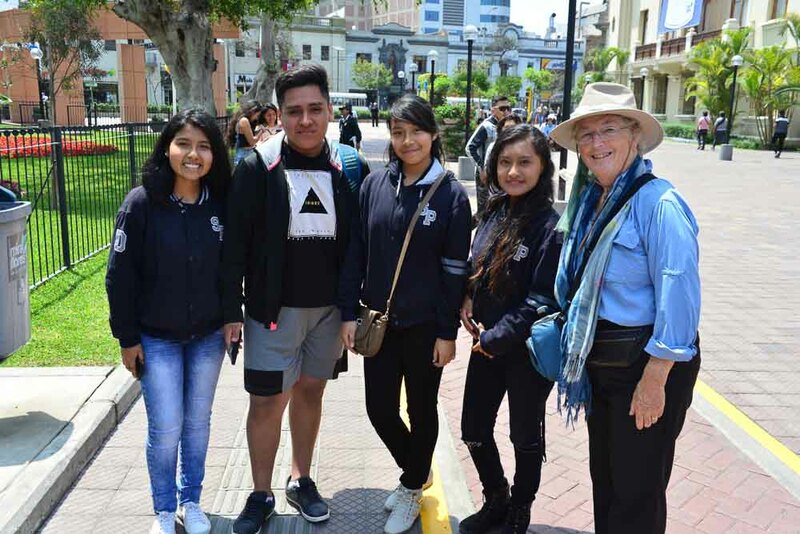 I was interviewed by these students as part of a school project. Love heart do you think? 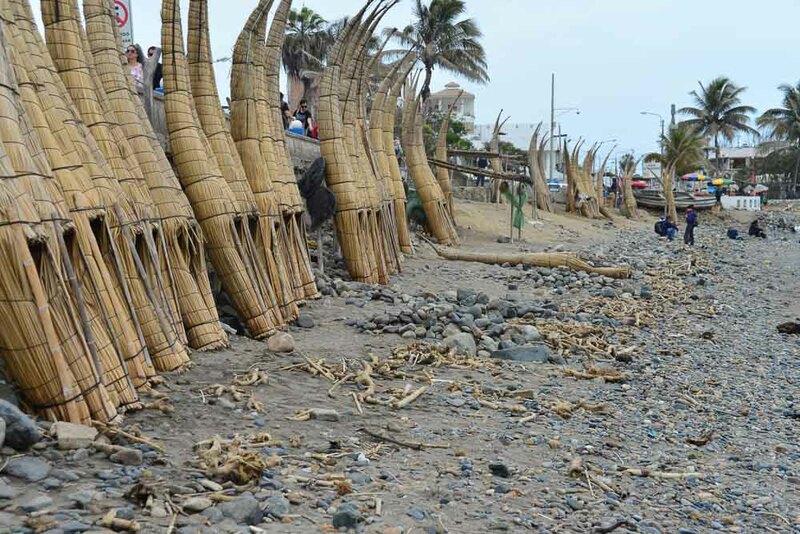 This is where surfing started in Peru. 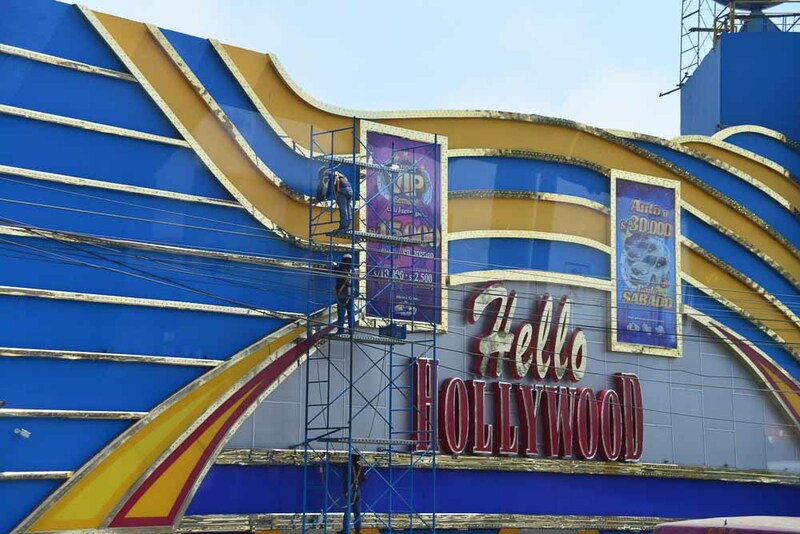 Last but not least … here come the casinos! 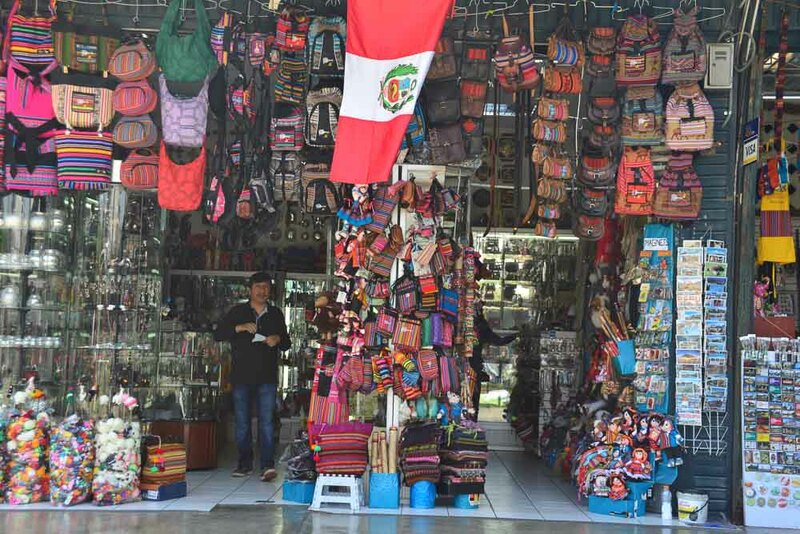 One thing has been very striking as we visit these cities in central and south america. 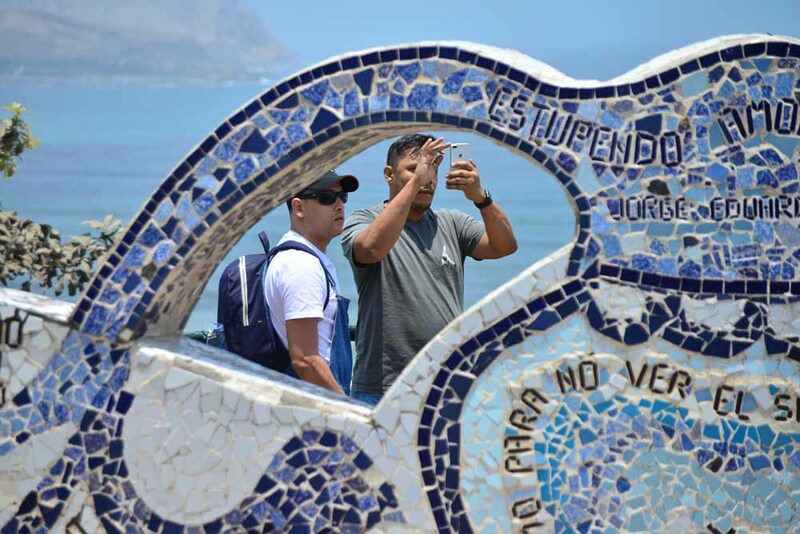 There is always a “tourist” or “cultural” or “colonial” area that tourists and travellers are funnelled to. While we are being funnelled, however, the increasing homogenisation of cultures becomes obvious. We travel in luxury coaches … even the local buses are comfortable … down wide roads filled with cars, trucks, buses and traffic jams. It takes an hour from the edge of the city to reach the centre and the bit you have come to see. Along the way the buildings look the same everywhere, the clothes people wear are all the same and shopping seems to be the main activity. The skylines are of tall blocks of apartments, mobile phone towers, cranes on construction sites, industrial areas and every port has it’s container terminal. Huge shopping malls abound … no sign of bicycles or mules; carts or gardens here. We are all blurring into the same mould. On that note, I will finish this missive. Next is Chile and the gateway to Santiago. I am thoroughly enjoying your travels with wonderful photos and commentary. Jacquie is glowing. 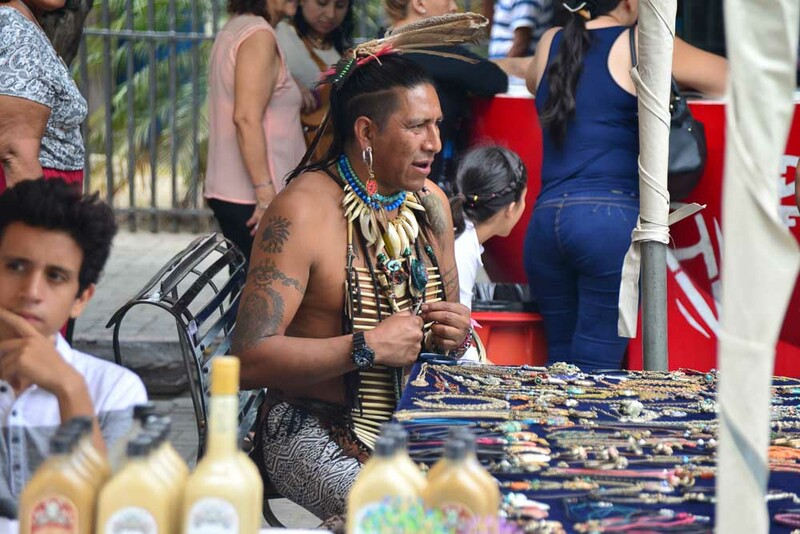 Did you buy Panama hats and those swanky shoes? The markets are so colourful and interesting and I loved the reed boats. They make a larger version, think viking style, on Lake Titicaca on the Uros Reed Islands. I was unaware that the desert went to the ocean along that northern coast. Fascinating. Enjoy your next part of your journey. Would love to catch up when you return.. Wonderful journey we are all having, thank you. I wrote a long comment. It disappeared…me and technology! So: fabulous pix, loved the little reed boats. The markets! Textiles and jewellery and hope you bought a pair of orange shoes! In Lima 1961 en route to London, and remember the Cathedral…no charge then. And appreciated your comment re. the homogenised world the West is creating. Sad. Woweeee, more like it, even without the donkeys and carts. The small reed boats really caught my eye…boats of this nature are still made by Anotiginal people in Oz, but I think mainly for exhibitions. And of course the fabric and jewellery…thought you ‘d look very groovy in orange shoes! Did you buy? Am so enjoying your journey while I sit in Gypsy at Little Bay nr.. Horrocks, WA. Was in Lima in 1961 on our, that’s Jenny & me, famous trip to the UK. And I remember the cathedral…no charge then. Wow again, the pics of Chan Chan !